Go to osm.org right now and click the edit tab. Select the “Edit with iD” and check it out. I’ve always felt OSM was held back by it’s editing tools. They are designed by nerds for geeks. That’s not some crazy Potlach (now I did love that tool but it isn’t mainstream) method that only OSM users know. These are simple methods that everyone will understand. I do hope that it will also improve OSM’s biggest weakness, addressing. But in the meantime we should see lots of people start improving the map all around the world. 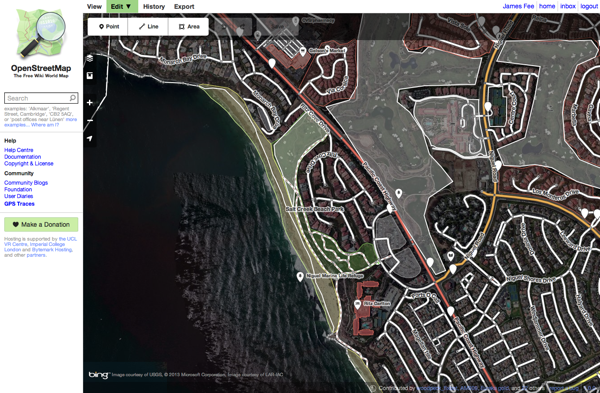 I have to be honest, when I first heard MapBox got a grant to improve OSM editing I thought it was a waste of time. There were already tools available, why not spend that money on something worthwhile. Well seeing iD in action, I feel like I need to take that all back. I no longer have to install Flash to edit OSM, that’s worth it’s weight in gold. I can imagine how this might look if another company did it, probably build in Silverlight with some crazy proprietary APIs. We should all be thankful MapBox took this on. Update The OSM Blog has much more.